A Walk in the Dark is an action platformer. You play as a cat, Bast, running through a dark fantasy world. You’ll be running, jumping and sliding with smooth and precise controls designed to make you feel like a cat. But it won't be easy. You never know what lies in the shadows. In this dark journey you will face strange creatures and dangerous traps. A story driven platformer set in a dark fantasy world. Fluid controls and animations: play as a cat, move like one. Challenging levels set in a dark, strange and dangerous world. Gravity inversion mechanics that will test your skills and ability to adapt to new gameplay. “Arielle and her cat, Bast, are spending a pleasant afternoon in the forest. Bast, free from the usual four walls of their home, can’t stay in one place. He runs around, playing with everything that moves. In his haste to enjoy everything, he ends up getting away from Arielle. He hears her calling for him, but the forest is such an interesting place. There are so many things, so much space. Some little creatures challenge him. Bast pursues them. It feels great to run in the forest. He is about to catch one of them. He jumps to grab it but misses. He falls on top of some old stones. Something breaks under him. A cold breeze ruffles the trees chilling him to the bones. A smoke rises forming a shadow. Someone, something, hovers above him. Some ancient foul-smelling thing that nails him to the ground. Bast is unable to move. Nearby, Arielle calls for him. The thing, the Spirit, turns around. As Arielle comes closer, the Spirit flies in her direction and envelops her. Bast hears the muffled screams of Arielle. They grow fainter as the spirit disappears in the forest. I really adore this game. It gets presented with highly stylized art and a stellar soundtrack based around a piano, which makes the whole experience somehow chilling yet calming at the same time. Once again an indiegame defines itself not by offering overly complex gameplay or new ideas, but a very personal and emotional setting and style. 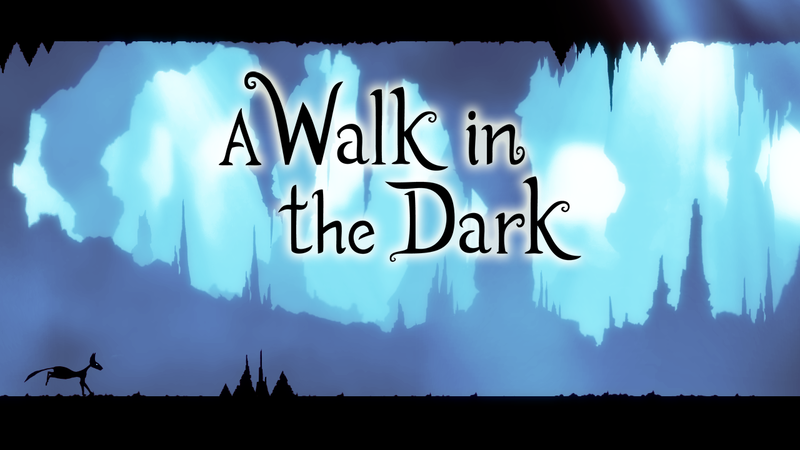 A Walk in the Dark is currently trying to get onto Steam via Greenlight! If you have a Steam account, why don't you go and vote for it? Reminds me of limbo for sure as far as the style goes. The sound track is wonderful as well and it looks like a decent game. I think its safe to say we all agree the piano soundtracks for this game are absolutely fantastic, could listen to it all day. As for the game itself it looks really interesting and challenging parts, I will be sure to grab this game whether or not it can get into Steam! This sounds so cool! I Love cats!!! Ah, and here I was thinking what should I play. I will try this out. COME ON, NOW HE'S JUST TROLLIN'! The soundtrack sounds awesome, SOLD. I just bought the soundtrack and downloading as I type. And I'll surely be doing the same for the game very soon. Now I feel bad for kinda ripping the 128kb/s previews because $9 for an indie soundtrack of half an hour length felt a bit odd to me after all my other bandcamp purchases.